When traditional target archery gets a little boring, aerial archery may be the solution. Aerial archery, or as we call it, Bow Trap, is a form of moving target archery, combining the skills of archery and clay shooting. A 30cm foam disc is thrown up in the air by a Laporte Phoenix trap. Once in the air the archers can take aim and strike the disc in flight. The disc’s flight can be altered by adjusting the trap to suit the archer’s skill and expertise, allowing even novices the chance to down the flying target. 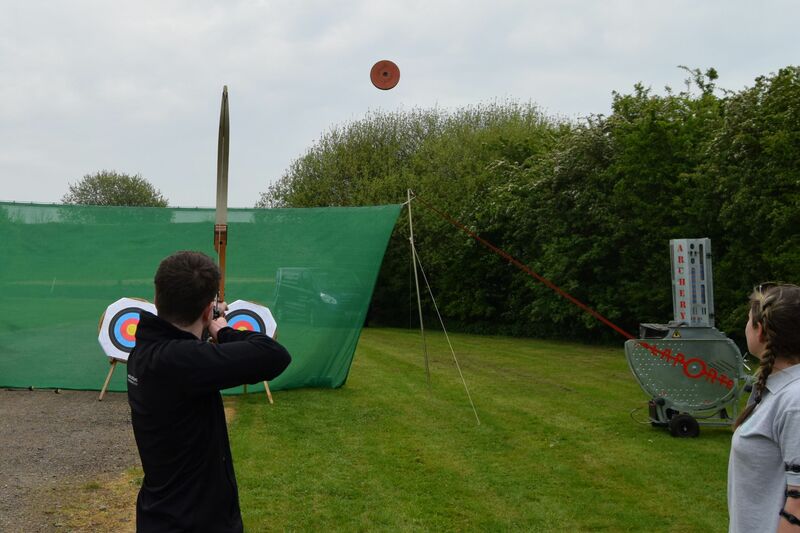 Aerial Archery is available as a standalone activity or can be added to a Traditional Archery session or a game of Combat Archery to enhance the sessions impact. Sessions can also be run using safe, foam tipped arrows, meaning that with sufficient space aerial archery can operate inside and out. Our instructor will welcome participants before giving a short demonstration of the equipment. Soon the targets start to fly, and the archers draw, take aim and release! Sessions can be tailored in both content and duration to suit your event. For outdoor shooting, we require a large flat expanse of short cut grass with no obstructions.